The world is going to have more than 2 billion cars on the road by 2020. Add the ~770 million trucks that would be present as well – and you will get a fair idea of how busy the traffic system would be, and how challenging it will become to find convenient, safe parking spots. A recent Goodwin survey found that, nearly 30% of traffic congestions in urban downtown areas are caused by drivers frantically looking for spaces to park their vehicles. Things can, potentially, get very chaotic. As we move towards smart cities (in January 2016, there were as many as 235 smart city projects), the importance of smart parking and traffic management is increasingly coming to the fore. To put things in simple terms, ‘smart parking’ can be defined as an automated mechanism that helps car-owners/drivers to locate and navigate to available parking slots in their locality. The real-time data is transferred from sensors (placed in the parking areas strategically) to dedicated applications installed in the handheld devices of users. In addition, the smart parking management setup can also help individuals book parking slots in advance, by automating payments. The objective of deploying smart parking systems is straightforward enough – to reduce the driving time required to find parking spaces, and to make optimal use of available parking slots. 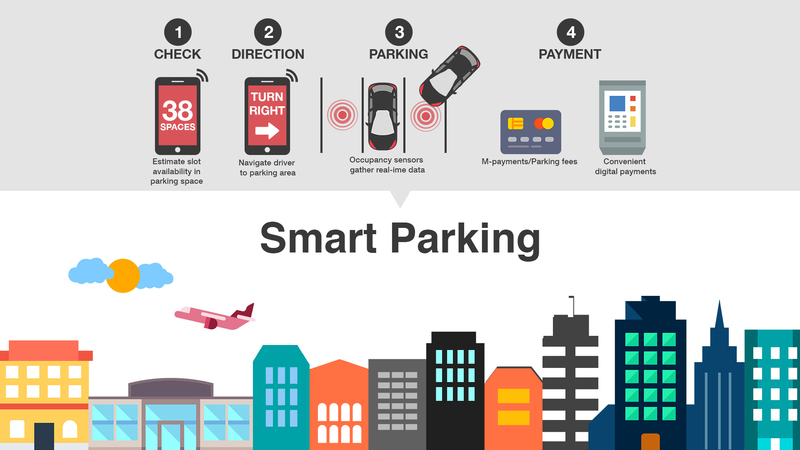 Smart parking has, over the last few quarters, emerged as one of the most important sub-domains of Internet of Things (IoT) and in the creation of truly ‘smart cities’. In a recently published report, the global smart parking industry has been projected to move beyond the $26 billion mark by the end of 2021, with the market CAGR hovering around 18%. M-payments (e.g., via Apple Pay) for making payments to parking authorities are also expected to increase significantly. The United States, rather expectedly, leads the way in terms of adoption of smart parking systems, with the American parking management market predicted to reach $9.3 billion by 2021. Use of low-cost, long-range sensors (many of them working on LPWAN technologies like LoRa) will grow at a CAGR of 18.28%. Navigate the drivers to those parking slots. Parking sensors/Occupancy sensors – In each and every parking facility, a set of RF sensors have to be installed. These sensors would relay real-time data about the availability (or otherwise) of slots to nearby drivers. These ‘occupancy sensors’ need to run on battery (wire-connectivity is impractical, given the high number of sensors that have to be used), have long-range RF capabilities (either with a mesh network or with LoRa technology), and offer excellent accuracy. The number of ‘false positives’ generated by a sensor have to be minimal. The other point of concern related to the parking sensors is related to the durability of the latter. If they are placed outdoors (as they often would be), care has to be taken to make sure that their functionality is not hampered by weather elements (direct sunlight, humidity, rain, etc. ), and there are no damages when a car moves over them. The power management algorithm (for the longevity of the sensor batteries) and the actual positioning/placement of the sensors are also vital. Gateway hardware– Changes in the availability of parking slots will be reflected through a status change of the sensors – and that, in turn, will be collected in a gateway. Unlike the sensors, the gateways have to be operational round-the-clock (the sensors are functional only when their status changes). The data collected in the gateway are then sent on to the centralised server. IoT gateways are not particularly cheap – and authorities need to rely on long-range, low-power RF technologies to ensure that efficient use of each gateway. On average, every smart parking gateway should be able to handle data from 450-500 parking sensors. High-quality enclosures and power/voltage protectors can increase the life and performance of gateways. Server – The server in a smart parking setup needs to have 2-way communication protocol support. On the one hand, it will receive the data from the gateways – to generate updated information about the free and occupied parking slots in any facility. At the other end, it will send real-time notifications to the dedicated mobile app in the user’s device – to guide them to the parking area, and the particular ‘vacant’ parking slot. A detailed map of the parking facility will also be sent from the server to the user, for additional guidance. Depending on the drivers’ location and preferences, they might need ‘off-road parking’ or ‘on-road parking’. The computations performed within the server and the information sent by it to mobile applications have to vary accordingly, to provide personalized service to each driver. Country-specific parking regulations also have to be taken into account. Mobile application – The final component of the smart parking architecture is the dedicated mobile app – which serves as the touchpoint for the final users (the app can be installed on smartphones and tablets). After receiving notifications from the server, the app would help the driver to navigate to the empty parking slot (no more confused driving around and resultant frustrations!). For this navigation, the application will either rely on the tools placed in the parking slots (off-road parking) or the phone GPS (for on-road parking). Users can provide a confirmation on the parking application, after they have parked the vehicle in the scheduled slot. This stored data would help people find their parked cars later (once again, the app would guide them to their vehicles). In essence, a mobile car parking app – working inside a smart parking architecture – helps users locate a parking slot, arrive there, park their cars safely, and find their cars later on. Popularity of Intelligent Transportation Systems – Smart Parking can well be referred to as a subset of Intelligent Transportation Systems (ITS). The trend of rapid urbanization is apparent in most major countries across the globe – and by 2030, around 62% of the world’s population will live in urban areas. There will be urgent requirements for end-to-end analysis and secure sharing of networked resources, to improve the standard of public transport solutions – and that can be delivered by custom-built ITS systems. The growing awareness about, and the implementation of, ITS is boosting the popularity of smart parking technology. Surge in the automobile industry – In the entire 90s decade, 39 million cars were sold across the globe. Cut to 2017, and the corresponding figure is projected to reach 77.83 million units. To put things in perspective – the number of cars sold this year alone will be nearly double of that sold between 1990 to 1999! The value of the overall automotive supplier market in 2016 was nearly $675 billion – with Volkswagen, GM and Toyota among the forerunners. A related point, and one associated with the growth of the smart parking market, has been the unprecedented growth of connected cars worldwide. According to a Gartner report, 20% of all on-road vehicles will have network connectivity in some form by the end of this decade – and close to 10 million self-driving (fully autonomous) cars will be in active use. Vehicles will be able to communicate with each other real-time, for smoother traffic maintenance, safer driving experience, and obviously, easier parking. Availability of powerful sensors – Thanks to the rapid advancements in IoT and connectivity standards, there are different types of data sensors currently available in the markets. Many of these sensors support 2-way M2M communication – and hence, can easily be used in the smart parking architecture. Information on availability of parking slots is shared from these sensors to ‘connected cars’ instantaneously. The availability of high-quality LPWAN gateways is also going up – contributing to the spike in the smart parking sector. Greater emphasis on telematics data analytics – This is where the leading telecom companies in various countries come into the picture. By collaborating with the top OEMs (original equipment manufacturers) from the automobile market, they can generate in-depth analytics services for all the telematics data generated. This analysis reduces traffic congestion risks, offers personalized services to drivers of connected cars, and opens up great savings opportunities for smart parking service providers. Smartphone/tablet – The personal device which has the parking app installed in it. It receives data from the server, navigates drivers to available parking slots, and also serves as payment gateways. Parking provider – Smart parking is, in essence, a M2M application – and it is provided to users by the ‘parking providers’. These providers have to arrange for both ‘off-road parking’ and ‘on-road parking’. Service Platform (M2M) – This is the platform on which the occupancy sensors, the gateways, and the server can seamlessly interact. Parking sensors – The sensors that are positioned in the parking facilities. These M2M devices directly communicate to gateways as soon as their status changes. Parking meters – These devices calculate the total amount payable by the drivers as parking charges. In smart parking, third-party human touts have no role to play – and users only have to pay for the exact amount of time they use the parking service. Note: The parking bills are issued by the designated ‘billing provider’. Law enforcement unit – These are, generally, the nearest police centers. These units track probable violations of smart parking regulations, and determines fines and penalties. i) Parking slots found quickly – Researches have revealed that additional driving required for searching parking areas can be reduced by 21% – when a properly functioning smart parking system is in operation. The time required to find a vacant spot for parking goes down by a whopping 43%. ii) Avoiding traffic congestions – 1 out of every 3 traffic jams are caused by irate drivers looking for public parking spaces. When there is an automated system to directly navigate them, such on-road congestions would obviously go down. iii) Optimal usage of parking spaces – In a normal (read: traditional) parking regime, it is impossible to ensure that the parking facilities available are being efficiently utilized. Due to lack of information, some slots might remain empty – but drivers might not know about them. With the real-time information from parking sensors, that problem goes out of the window. iv) More fuel-savings – When parking slots are found quickly, extra driving is not required – and hence, less fuel/gas gets used up by cars. Experts from the field of IoT have estimated that this fuel-savings are likely to reach 0.22 million gallons by 2030, and a massive 0.3 million gallons by 2050.
v) Greater revenues – Smart parking involves the use of advanced monitoring, information transfer and data analytics methods – leveraging the IoT ecosystem to the fullest. The real-time management and intelligent decision-making capabilities help in generating more revenues. vi) Pay as you use – The parking meters and billing providers collaborate to notify the users about the total parking fees they have to pay. There are no chances of a person being charged more than what (s)he should. vii) Accuracy – Minimal ‘false positives’ and highly accurate predictions/tracking of empty parking slots are key characteristics of any good smart tracking setup. There are no uncertainties involved – and car-owners can (nearly always) find a parking area in their locality, as and when they need. viii) Less frustrations – Driving around in search of parking slots is not only a waste of time and fuel – it can be acutely stressful too. In China, the average number of people in a car is 6.75 (the corresponding figure is 1.4 in the US) – and things can get very frustrating indeed, if the lookout for a parking space goes on for too long. Smart parking promises a quick and satisfactory getaway from such troubles. ix) A cleaner environment – The more you drive, the more will be the emissions from your car, and the more polluted the environment will become. Smart parking solutions can reduce emissions by up to 30%. x) The safety factor – The presence of sensors and real-time parking management systems ensure that risks of car thefts and other forms of unauthorized vehicle access is close to zero. Aided by the smart parking system, a person can park his/her car without any worries, and find it later with ease. While there is no scope for doubting either the need for smart parking systems or the benefits these IoT tools can deliver, there are certain challenges that can crop up during the implementation stage. For starters, the authorities have to be ready to make the required investments for the sensors, the gateways and the server(s). The total expenses are not likely to be too small, and there are often hidden costs involved. What’s more – incorrect positioning of the gateways and/or damages caused in the sensors can drive up costs significantly. The reliability of the LPWAN technology to be used for a smart parking system also requires close scrutiny. Unless a sensor can: a) detect whether a car is present in a parking slot or not, and b) send the info on a real-time basis to the gateway, it is fairly useless. LoRa technology, when implemented optimally, can yield the best results. Region-specific and user-specific factors can also pose constraints in the path of smart parking. It’s all very fine to plan for big cities – but in smaller, less sophisticated locations in developing countries, a significant section of the population might not own smartphones. The idea of having to download a new app and having to share card information on it (for parking payments) might not seem particularly attractive to everyone either. There can be challenges in the enforcement of smart parking regulations as well. Say, a car driver books a parking slot in advance for four hours, but leaves it within two hours. Ensuring that (s)he gets charged for only the two hours (and not four, as recorded in the parking meter) is important. The sensors have to efficiently track the arrival and departure times of vehicles from a parking facility. Lastly, there lies the factor of mental change. We have been used to decades of traditional parking practices – and suddenly changing over to a wholly automated setup can seem strange to many. The change has to be gradual, awareness levels have to be increased, and the convenience factors/benefits of smart parking have to be emphasized – to make IoT-driven parking management systems a success. The potential for expanding the smart parking industry is enormous, and the technology has several important advantages too. As with any new technology, there are some challenges – but as we move towards better M2M communication standards and a more ‘connected world’, the issues can be resolved and car parking can be made easier than ever before!